Rising fuel costs and depleting natural fuel resources is driving the concept of electric vehicles as a cleaner transportation alternative. While the world is still steeped in its car culture, it is slowly beginning to embrace the coming age of electric vehicles. In fact, there is an increasing interest in smaller, but efficient and highly comfortable electric vehicles, which is pointing to a future of three-wheel electric vehicles. Our bloggers will walk you through the interesting coming age of three-wheel vehicles and how they are set to prove to be a safer and environmentally-friendly form of transportation in the coming years through this new blog series. Electrified road transport has been around for more than a century now. It was in the 1930s that light-duty battery-run passenger cars were displaced almost entirely by petroleum-fueled internal combustion engine (ICE) vehicles. EVs made a comeback in the 1990s and has been enjoying a growing market in the last 10 years owing to volatile oil prices, deteriorating urban air quality, and climate change. This renewed interest represents a “third age” of electric vehicles, starting with the mass-market introduction of EVs in 2010. From e-rickshaws to disruptive new forms of three-wheel electric vehicles, companies like BMW, Yamaha and Toyota are setting the stage for enclosed three-wheel electric motor vehicles. Several recent surveys across the globe point to underutilization of cars. On an average, there is no more than 1.2 passengers travelling in a car designed for four passengers. This trend points to a market that is likely to embrace a smaller and more fuel-efficient vehicle that is as safe as a car. While two-wheelers still carry the apprehension of road fatalities, three-wheel covered electric vehicles come with increased stability, better lean control and also the safety shell that is provided by a car. Such a market demand is beckoning automakers to increasingly develop compact three-wheel electric vehicles that are cost and fuel-efficient, along with enhanced stability. Delta or Tadpole – Who wins the stability race? One of the major drawbacks that three-wheeled vehicles faced was their lateral stability, especially when taking sharp turns. With the scales of balance tipped more to the rear than the front, the vehicle was often found tipping over before sliding during turns, making it extremely unstable and dangerous. To overcome these problems, conventional Delta design has been replaced by the Tadpole design. Tadpole design is more stable while cornering or turning at high speeds. In addition, this design gives the vehicle a teardrop shape, round at the front and tapering at the back making it highly aerodynamic. Continuous improvements have been made over the years to make the three-wheeled more stable. For instance, the problem of tipping over at turns in some delta shaped vehicles has been overcome by developing a motorbike like tilting mechanism which allowed the cars to tilt while turning. One of the patents (JP5846087B2) recently granted in January 2016 to Automobile OEM Toyota talks about the tadpole design. This invention discloses a hybrid three-wheeled vehicle with main focus on maintaining the weight balance of the vehicle. In order to make this task easy, the engine, the motor generator, and the transmission are placed appropriately that not just drives maximum balancing but also aid in increasing the fuel efficiency of this hybrid vehicle. Another recent and interesting invention in this domain is witnessed from yet another automobile manufacturer – Ford Motors. 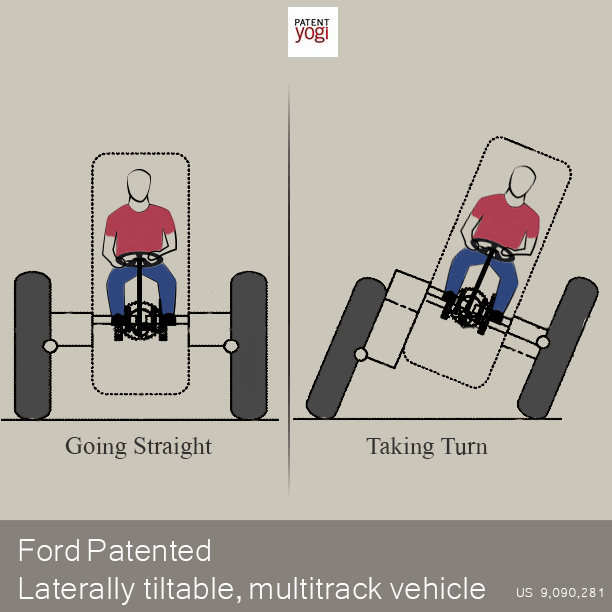 US patent 9,090,281 granted to Ford in July 2015 entitled ‘LATERALLY TILTABLE, MULTITRACK VEHICLE’ discloses a tiltable three-wheeled tadpole design that has the ability to self-upright after tilting. Now it is a known automotive fact that the front wheels oversteer while the rear wheels understeer. In the situation of applying brakes, having just one wheel in the rear helps in maintain stability, considering its understeering quality. This allows for enhanced protection and stability while taking turns, making the tadpole style a tad better and much safer alternate. Companies such as Honda, BMW, Piaggio, Peugeot, Toyota and Carver Engineering have already launched their three-wheel electric vehicles. BMW is one of the pioneers that launched its tadpole design ‘Isetta’ (also known as bubble car because of its egg-like design and bubble-like windows) way back in the 1950s. It was a top selling car with a single cylinder to achieve a fuel economy of 3 L/100 kms. The market was later introduced to several other designs, such as the Piaggio ‘MP3’ – a tilting electric three-wheel scooter that comes with incredible stability when turning, braking, riding on wet pavement. ‘HYmotion3Compressor’ is a three-wheeled tilting trike that comes with a hybrid design from Peugeot. Carver Engineering launched ‘VentureOne’, a three-wheel tilting plug-in hybrid vehicle powered with features like tilt control and front wheel steering control. ‘3R-C’ is yet another three-wheeled electric car from well know OEM Honda. In our next blog, we discuss aspects of safety control systems in three-wheel electric vehicles and interesting IP associated with it. Surbhi is a patent professional who is working towards donning the role of a businesswoman and philanthropist. She enjoys learning about developments in the field of medical science. A pen collector, she enjoys feeding gourmet meals to pigeons. Himanshu is an IP Analyst with expertise in medical devices, including human body implants. He is an automobile and retail enthusiast and this reflects in his blogs.